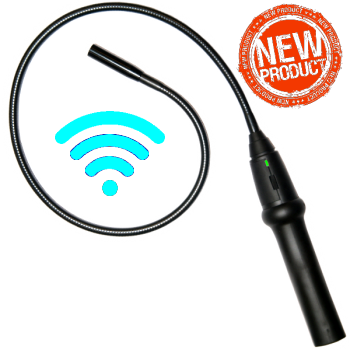 The ergonomic handheld Wifi Inspection Camera comes with a Flexible 77cm tube, a 300k water-resistant camera complete with four adjustable LEDs and is able to capture high quality colour images and video through the App. It comes with built-in Li-ion batteries that can be charged by a USB charger and works for around 2 hours once fully charged. - Semi-flexible insertion tube which is bendable to see around a corner or to look directly at a feature in a bore. - Available with 77cm cable, enabling to reach places that you cannot reach but still need to. - Capture high quality colour images and video by the touch of a button on the App. - Works with iOS and Android Smartphones/Tablets. - Perfect candidate for household use, pipeline inspection, Security checks, Automobile inspections etc.